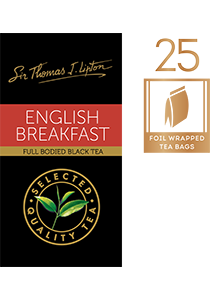 A full-bodied black tea with a blend of Kenyan, Ceylon and other black teas for a robust, bold flavour that goes well with milk. Also available in packs of 100s and 500s. Other flavours to complete the range are Earl Grey, Decaffeinated, Green Tea, Green Tea with Jasmine, Peppermint, Lemon and Chamomile.